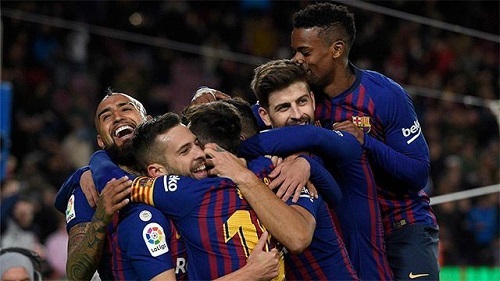 FC Barcelona booked their ninth consecutive trip to the Copa del Rey Semi-Finals following a magical night at the Camp Nou that saw them defeat Sevilla 6-1 to overturn a 2-0 loss from the first leg and advance thanks to a 6-3 aggregate result. Barça’s goals came from a Coutinho brace and goals from Rakitic, Sergi Roberto, Suárez and Messi. Barça struck early when Coutinho converted from the spot in the 13th minute after Messi was brought down inside the box. Sevilla could have equalized but Barça’s goalkeeper Jasper Cillessen first denied Andre Silva from close range with a great stop and then saved Ever Banega’s penalty in the 27th minute after Gerard Pique fouled Roque Mesa. Barça doubled their lead after the half hour mark when Rakitic’s fine touch redirected a superb long pass by Arthur for Barcelona’s second goal of the evening. Barça kicked off the second half by continuing where they left off and Coutinho scored his second goal of the night in the 53rd with a header from a Suárez cross. Before the fans could stop celebrating the third goal of the evening, Barça scored again when Messi set up Sergi Roberto to score the fourth goal a minute later. Sevilla managed to pull one back after Guilherme Arana scored from his long strike in the 66th minute to make it 4-3 on aggregate and give his team some hope. However, those hopes were dashed when Suárez and then Messi scored in the dying minutes to make it 6-1. This result meant that Barça will be playing in their ninth consecutive Copa del Rey Semi-Finals and will be joined with Valencia and Real Betis with Real Madrid yet to play but enjoying a 2-0 aggregate lead over Girona. The Copa draw will take place on Friday but Barça will now shift their attention to this Saturday’s league clash at the Camp Nou against fellow Copa Semi-Finalists, Valencia. FC Barcelona: Cillessen; Sergi Roberto, Piqué, Lenglet, Alba; Busquets, Arthur, Rakitic; Messi, Suárez & Coutinho. Sevilla FC: Juan Soriano; Carriço, Kjaer, Sergi Gómez; Promes, Sarabia, Banega, Roque Mesa, Amadou; Arana & André Silva. Goals: 1-0, Coutinho (min.13 – penalty); 2-0, Rakitic (min.31); 3-0, Coutinho (min.53); 4-0, Sergi Roberto (min.54); 4-1, Arana (min.67); 5-1, Luis Suárez (min.89); 6-1, Messi (min.90+2). Cautions: Suárez (min.30), Roque Mesa (min.30), Daniel Carrico (min.34), Sergi Gomez (min.72). Previous PostBarça defeat Girona 2-0 in the Catalan Derby. Next PostBarça sign Jean-Clair Todibo and Emerson.